First, a story I forgot to tell last week, because I was Outraged. Some of you may recall that after the Great Mildew Blight, I had but one surviving pumpkin on my massive, world-destroying pumpkin vine. I nurtured it, petted it and talked to it, and was SUPER EXCITED about bringing it home this weekend so that it could fulfill its destiny as a Jack-o-Lantern, and later, a pie. Yes, that’s right. SOMEBODY STOLE MY PUMPKIN. Not a pumpkin, you’ll note – THE pumpkin, for there was only one. In a garden full of squashes and a couple of other pumpkin patches, they chose to steal the lone and lonely smooth, lovely orange pumpkin from MY garden. WHO DOES THIS? What kind of entitled jerk do you have to be to wander up to the community garden, which by the way has signs outside the gate telling people that no, this is not a public garden, because we pay for our plots every year, so no, none of these veggies are for you, and steal somebody else’s vegetables? Especially when you’re free to take from the public border on the other side, where you can find currants, raspberries, herbs, and a variety of other lovely things. People do this, of course. We’re constantly warning off people who just walk in and help themselves to tomatoes or a handful of lettuce leaves or zucchini. I’ve been losing zucchini a few at a time all summer, and recently, too. I was willing to let it go because a) I can’t spend all my time staking out the garden for vegetable thieves and b) it’s not like I didn’t have more. Clearly I am taking this somewhat personally. 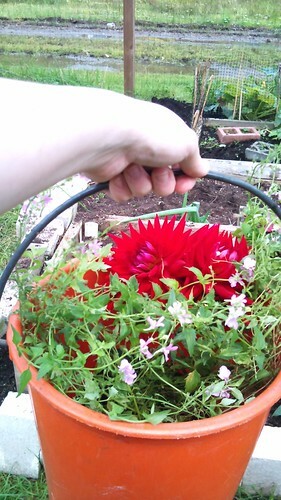 Today Mum came out and we did garden… things. 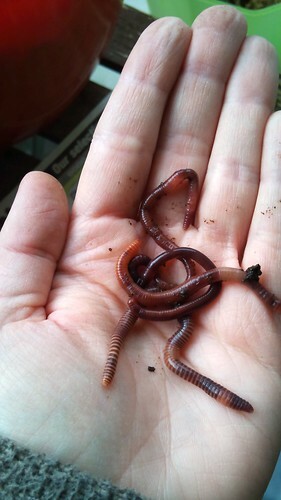 First and foremost was the first harvest of my balcony worm bin, which went rather well even if the compost had gotten a little too soggy. 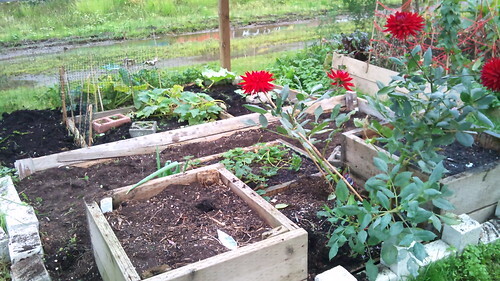 Then we tromped through the mud over to my community garden plot where we proceeded to winter-proof the garden. This involved mainly ripping out everything that wasn’t going to survive winter and also planting garlic cloves. I also came home with two pots of vagrant herbs (mint and parsley) which had apparently wandered into my plot from the next plot over. We got very muddy, but it was pretty satisfying, especially when we carried four armfuls of pumpkin and squash vines and two buckets of weeds across the garden and dumped them in the compost. Mum also took home some of Corene‘s flowers that I planned to pull up to make room for veggies next year. And then we came home and had tea and crackers and ate some of the delicious apples I got at the UBC Apple Festival last weekend. And guys, holy crap, these are delicious apples. They are sweet and tart and crunchy and I was going to put them in a pie but I think they may actually be too delicious for pie. And I am usually pretty ambivalent towards apples. I have never heard of Topaz apples, and now I am sad that I can’t seem to find them in a grocery store. Clearly I must hurry up and retire and buy a house so that I may plant two of these in my front yard. 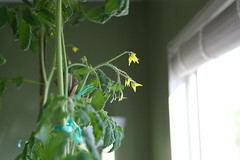 And then I re-potted six tomato plants. Hopefully they will not all die. Pictures of those tomorrow, perhaps, when it’s light again. I’ve learned my lesson about photographing plants at night. 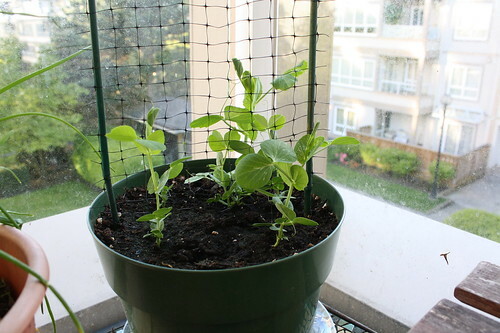 Now all I need is a light for the tomato plants and a cheap electric toothbrush (no, seriously, this is apparently how you pollinate indoors), and we’re all set for winter. Click for whole photo set! Yes, it’s all still alive. Well, mostly. 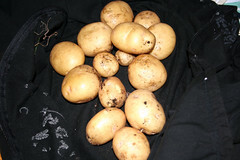 Just after I dug up all the potatoes a while back, my plot was beset by a mildew infestation – one of the neighbouring plots had it, left it untreated, and then it spread to the entire garden. 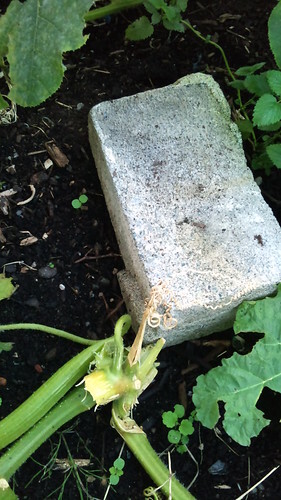 Before going to Florida, I hadn’t had time to do much beyond cut out dead leaves from the affected squash and zucchini plants, and when I got back, I found it had attacked the pumpkin vines. So tonight I finally had time to march down there with a pair of clippers and gloves to protect me from the spiky squash vines and do something about it. 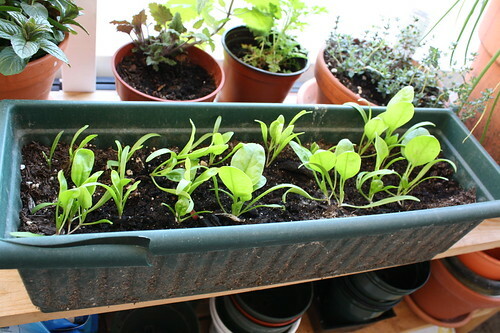 As both treatment and preventative measure, I sprayed the leaves of the beleaguered plants with a milk/water solution that the other gardeners have had a lot of luck with. This actually seemed to work almost immediately, so hopefully the bits and pieces left of zucchini and squash plants will revive enough to give me a few more edibles before it gets too cold. I forgot to photograph my only surviving pumpkin of meaningful size – the two that had made it to fist-size before I went on vacation succumbed to rot while I was gone, despite ‘s no-doubt heroic efforts. But I’ve got at least one, and it’s not rotting! It’s big! It’s orange! I perched it on a brick to keep it from the damp and watered all the squashes very, very carefully, not wanting to wash off the milk solution. I hope I get at least one pumpkin out of the plot, or I shall be very disappointed. And I forgot to check the garlic. Damn. 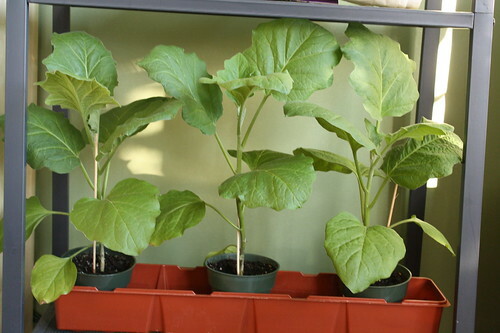 Need to do that very soon, I think, since their leaves have by now been entirely shaded to death by the rhubarb and pumpkin leaves. 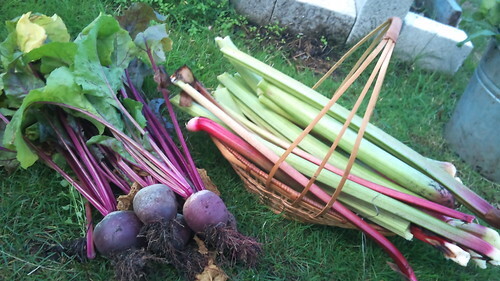 Speaking of the rhubarb, its time finally came, and I pulled it all up tonight. 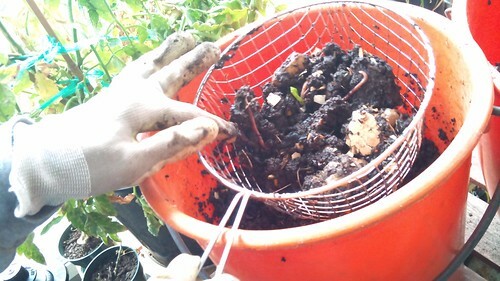 I put about six armfuls of various gigantic rhubarb and squash leaves into the compost tonight – the worms should be very happy. I also pulled up most of the beets, which are of substantial size, I think; most about the size of my fist, which I admit isn’t very big, but isn’t bad for vegetables I planted out of boredom and largely ignored all summer. 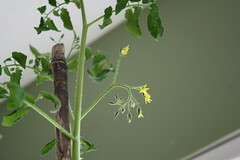 I feel much better and less neglectful, though there’s still some dead flowers and a lot of weeding I didn’t get done tonight, and I need to transplant my indoor tomato seedlings to bigger pots (I only have pots for about half of them – have to figure out where I’m going to get more! 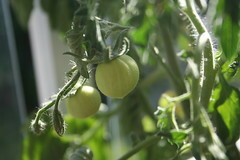 ), and I need to find someplace indoors for the big healthy ones currently fruiting on the balcony. But there’s always next weekend, I guess. I finally took my camera to the garden! 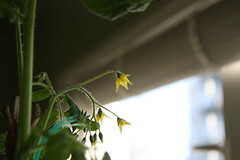 New pictures of teeny vegetables and also you can bear witness to my growing Flickr addiction.